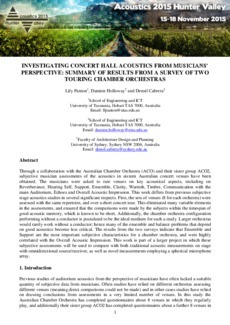 Through a collaboration with the Australian Chamber Orchestra (ACO) and their sister group ACO2, subjective musician assessments of the acoustics in sixteen Australian concert venues have been obtained. The musicians were asked to rate venues on key acoustical aspects, including on Reverberance, Hearing Self, Support, Ensemble, Clarity, Warmth, Timbre, Communication with the main Auditorium, Echoes and Overall Acoustic Impression. This work differs from previous subjective stage acoustics studies in several significant respects. First, the sets of venues (8 for each orchestra) were assessed with the same repertoire, and over a short concert tour. This eliminated many variable elements in the assessments, and ensured that the comparisons were made by the subjects within the timespan of good acoustic memory, which is known to be short. Additionally, the chamber orchestra configuration performing without a conductor is postulated to be the ideal medium for such a study. Larger orchestras would rarely work without a conductor; hence many of the ensemble and balance problems that depend on good acoustics become less critical. The results from the two surveys indicate that Ensemble and Support are the most important subjective characteristics for a chamber orchestra, and were highly correlated with the Overall Acoustic Impression. This work is part of a larger project in which these subjective assessments will be used to compare with both traditional acoustic measurements on stage with omnidirectional source/receiver, as well as novel measurements employing a spherical microphone array.